Saucony Guide ISO are stability cushioned running shoes. The Saucony Guide ISO (actually Guide 11 if stuck to number based codename) finally incorporates latest development of ISOFIT upper already available in more expensive Saucony models like its bigger sibling the premium Hurricane ISO 3 although becomes a more conventional and integrated solution, not like the external stiff structure from first releases. What is a almost a premiere is the new flagship foam PWRFOAM which replaces well known and reliable SSL EVA in midsole in a similar way (including price increase) its popular counterpart for neutral runners Ride 10 does. As a summary, the Guide ISO is a great running shoe featuring latest technologies with progressive pronation control to enjoy long distances. 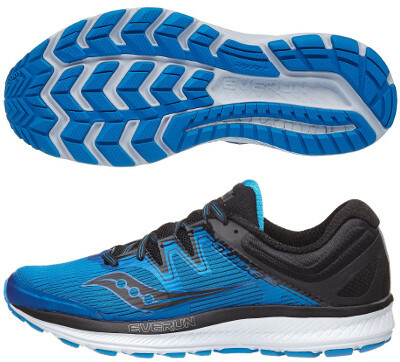 There are many changes compares to its predecessor Guide 10 which already introduced many and interesting enhancements, a clear signal that Saucony is trying to gain some market share doing things in a different way. Most attractive one is the latest development of ISOFIT system (fully integrated in the upper, not any more as external cage) embracing the midfoot and combined with fused elements (FlexFilm) for snug and secure fit. Seamless mesh and bootie construction prevent chafing while offering great comfort and soft feeling. The other major change is the new material PWRFOAM used in midsole replacing classic SSL EVA although EVERUN™ layer remains on top of it for improved response. Typical medial post with harder density foam is used to provide progressive pronation control so it is mandatory to wait for reviews and feedback from unbiased tester to verify real performance. There also some improvements in outsole with deeper grooves to promote flexibility and therefore smoother transition keeping usual TRI-FLEX configuration. Outsole materials confirm great work and remain unchanged using lightweight and flexible (IBR+) in the forefoot to enhance cushioning and responsive ride while more durable carbon rubber (XT-900) in more exposed areas to offer reliable traction even on wet paths.